CIO and Darwin Magazines conducted a survey to gage CIOs’ use of IT analyst firms’ services to make IT purchase decisions. More than half of the executives we spoke with said that IT market research is important to overall IT strategy. Research is used most commonly to educate on a technology or an IT issue. Likewise, education was most frequently cited as the most valuable use of IT market research. The vast majority (84%) of respondents feel the information they receive from IT industry analysts is reliable. Additionally, the majority of respondents feel that the information is objective. However, they expressed concerns that the same companies that they report on are also clients, which leads CIO to believe that IT professionals may be unaware that most analyst firms have a mix of both vendor and users in their client base. CIO Magazine and Darwin Magazine conducted a telephone survey of 200 CIOs on their reliance on IT analyst market research in making IT decisions. We defined IT analyst firms companies that are not allied with a financial services company and that exclusively track information technology related products and services and offer written reports and consultative services on a subscription basis. 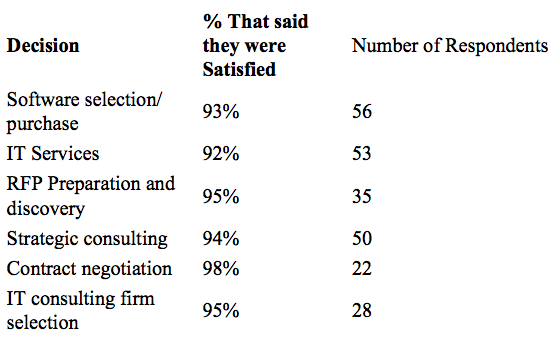 Respondents were randomly selected from CIO’s circulation file. Surveys were conducted between November 15 and November 28, 2000.
on IT market research in 2000.
average (16%) and making a vendor decision (14%). information they receive from IT analysts, using a scale of 1 to 7.
objective or fairly objective (answered 4 or 5). 40% were concerned or somewhat concerned (answered 4 or 5).